Technically Mission: Impossible 4-6 are the McQuarrie trilogy. He wrote Ghost Protocol, then directed/wrote Rogue Nation, and Fallout. I bought a sealed polybag version of Superman #75 for $20 as a Christmas gift to my brother. A lot of comic book collectors (myself included) thought we were gonna retire on that stuff. 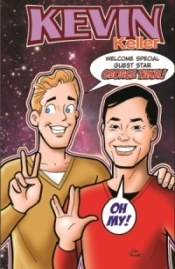 I wonder if Reed happens to have this novelty 2012 Archie issue with George Takei. Collectors item? I believe Kevin Keller is the first Riverdale character to come out of the closet.. He did a rewrite on Ghotocol but I don’t think he has an official credit on it. I think most people would still call it Brad Bird’s movie. I’ve never seen nor heard of this comic! “Fallout” is a generic title but no worse than some of the others. The following isn’t even a spoiler unless you haven’t seen Rogue Nation. I think the main “Fallout” thematic reference is to a passage made by Solomon Lane (Sean Harris) which alludes to Ethan’s misgivings and inability to remove emotions from his actions in Rogue Nation. Otherwise Lane wouldn’t even be a factor in this movie. Regarding Renner being absent. He had to film Infinity War 2 at the time this was going into production. But it was the fact that this started filming without a script that kept him away. They weren’t able to provide Marvel with concrete dates for when they would need him. McQuarrie offered him a cameo for the opening where he would have been killed and Renner passed. I think he’ll be back for the next one. McQuarrie apparently talked about this on a BBC1 radio interview which I haven’t been able to listen to but just read transcripts in an article. They started filming this with just an outline. An outline. How nuts is that. I think that shows the true trust Cruise has in McQuarrie. And please, please Reed, you have to start that instagram account. I’m still wondering if McQuarrie planned on Renner being Lark. Reminds me of the Star Trek VI situation in which Meyer wanted Saavik to be revealed as the surprise traitor. Weird, I didn’t notice the lense flares at all. Love Frank getting angry when he’s proven wrong, when the reason why Fallout is used is explained, it moves from meaning nothing to being stoopid. Lot of call backs to M:I3 in the latest film – when he leaps across the building matches the scene on the bridge. The car chases mirror each other in places and Benji giving directions is a call back too. Then of course you have the rubber masks and the cliff thing like in M:I2. Surprised at what seems like a cold reaction to Fallout from the FJ crew. I’ve been thinking about it since I saw it. The score, action, and acting are pretty great all round. I’m gonna recommend a Hindi film that most people will not come across, Pad Man. You’re Welcome. Also, I think the John Lark giveaway was early in the movie when he hands over an unbroken phone to Angela Bassett when we saw the real phone shattered in the bathroom. Yeah didn’t see the John Lark thing as a major reveal. I think it was intentionally obvious. Maybe it seemed cold because Jay wasn’t there. Usually when Frank’s going off about nitpicks it’s Jay that calls him out on it, assuming of course that Jay enjoyed the film. Even watching the film I knew the Michelle Monaghan portion of the was not going to go over well with Frank. Yeah I do wonder what Jay thinks of the movie. Here’s some more info on how the stunts were performed. The cliff face looks sheer in places but not completely. To be fair, Reed did give it his first 6/5. But yeah, maybe it was another case where the nitpicks overwhelmed the discussion. For me most of my complaints were related to story stuff which ultimately isn’t that important for a Mission: Impossible movie anyway. And I did like the score despite it being derivative of Zimmer’s Dark Knight stuff. I think Reed is right in bringing up the helicopter scene in Mission Impossible 1, that part is just as silly as any helicopter shenanigans in Fallout. You can say the blade stopped short is luck or whatever but Jean Reno flying the helo in the tunnel is just ludicrous. Ghotocol, just noticed this lol. Pleeease tell me you came up with that yourself? If so, this has gotta become FJ lexicon otherwise. It would’ve been good if Alicia was on to watch this movie. Then Frank could’ve turned into a kitten on this episode. While Fallout goes too far out of its way to show the stakes between Ethan and Julia, I recall on the Premium that Jay astutely pointed to how unnecessary and inconsequential their relationship was portrayed in MI:3. I think Greg would constantly refer to it as Ghotocol on the show. Or maybe all the guys came up with it, but I can recall Greg’s voice saying it. It’s definitely not mine, it was out in the world on social media quite a bit during the marketing for Ghost Protocol. The whole thing is ridiculous. It makes no sense to pull out one or two things and say a particular point is too absurd – when the whole premise is! All of the missions are too crazy to be considered in the real world, the gadgets are insane and the fact most of them are completed in any shape at all is amazing. If you swallow one part of M:I, you have to chug down the whole lot. It can be criticised for other things, but the absurdity of the plot is not one of them. Every movie has an internal logic that it follows and sets certain expecatations for believability. If it violates those, I think it is fair to call it out. You can disagree on whether or not it violates them, but I don’t think it is immune to criticism. One of my interpretations was that Walker was trying to implicate Hunt, because Walker who operated with no rules had a competitiveness with Hunt. McQuarrie could have went the other way and had Walker somehow redeem himself by sacrificing himself for Hunt. I don’t think Film Junk would watch a film that deals with women issues. That’s a fair point, although I think the rules of M:I’s own reality are already so wide and flexible that there isn’t much they can’t get away with. I mean, even the simple idea of a man running as hard and fast as Hunt does for so long without collapsing due to sheer exhaustion is nuts. From that base premise I’m not sure how you can draw a clear boundary around what is and isn’t believable in this world. Cruise Control running isn’t Mission Impossible logic, that’s Tom Cruise movie logic. His “Go-tocol” if you will. I don’t think I’ve ever seen him do it to such superhuman levels as in the M:I films. The issues with the film were being called out as “non-realistic” but nothing ever has been real in these films. Then you’d have to call out the fight scenes, the chase sequences – everything is hyper inflated. By their very nature they make the impossible seem possible. A week off would be well-deserved for you gents, but if you decide to record next week I can definitely recommend Eighth Grade. Saw it today and I think a good discussion could be had about how FJers would handle middle school these days. Idk, unless a film has excessive martial arts it’s difficult to predict his reaction. Yup, and isn’t that the point? My only issues are typically with the convoluted plots in these films and those are easy to overlook. My favourite setup is still the first one…I think. That doesn’t equate to them being realistic. There’s plenty of other things to pick out as problems with the M:I films. Questioning their realism doesn’t make any sense. I never questioned their realism. My issue with the plots is that thier twists yield diminishing returns now. It’s been ages since Cruise was in a realistically portrayed film. Even American Made didn’t fit that bill. My favourite MI setup was directed by Convoluted Plot extraordinaire Brian DePalma. I think I’ll be able to make it a week without a new FJ episode, it won’t be easy but I’ll make it with tears streaming down my face. Maybe I’ll just listen to episode 400 again! It is a masterpiece after all. But It would be so cool though if somehow just the guests could take over FJ for the week. I’m saying Reed, Dax, Greg, and Zak. It would be an insane Vibecast. Oh the gold that could come from that! Get a wierd retro review in there! This is making me aroused just thinking about it. Frank, the reason for the burn to Cavils face was all because of the studio. I listened to a podcast (forgive me fellow Junkers) with McQ where he said they wanted a villain with a scar, because focus groups identify easier with villains with scars or some BS like that. It was Empire’s film podcast if anyone is interested. It’s long and he goes through pretty much the entire making of the movie. There’s some good stuff on just how much focus group/marketing department BS goes into the making of a movie of this scale. It’s awesome this turned out so well, but I understand a little better now why so many don’t. McQuarrie said as much on the Q&A podcast, pointing out that Cavill has a BAD GUY MOUSTACHE. I kind of agree with Frank on the ridiculousness of the helicopter stuff, but there’s a lot of precedent for it in the past couple movies. The glove stops working on the Burj, Ethan gets lucky in the car garage scene and whenever the mask machine doesn’t work and he assumes the people haven’t met, and he basically dies in the underwater scene in RN. But yeah, this may have been the most showy “luck”. Love hearing Reed’s angelic little voice again. And did I hear a hint that he would be on the Jackie Chan premium?! As the resident Asian, I demanded my presence on the premium so that I could pass on my stereotypical misinformation and general lack of knowledge. See, now at that point, the unbroken phone told me (wrongly) that him setting up Hunt was with Hunt’s blessing, like Ethan wanted the CIA looking that way for some as-yet-unknown reason that would come out later. I am a little surprised Frank had no comment about how not only is Ethan Hunt a superhero now, he also has multiple prophetic dreams in the movie. About his ex, an ex-villain, and a nuclear bomb, before he knows of any involvement of those things. The very end of that second video shows that trailer shot that’s not in the film of Tom’s helicopter flying road level about to hit a jackknifing truck. IMO, it would’ve better when Walker has his big reveal, that he also reveals his English accent while talking to “Lane”. Then Cavill would’ve spoken in his normal voice for the rest of the film.